According to this handy little website, it is Donut / Doughnut Appreciation Day! I know there is a National Donut Day in June, but I fully support having two days a year when we can celebrate the mighty Donut. 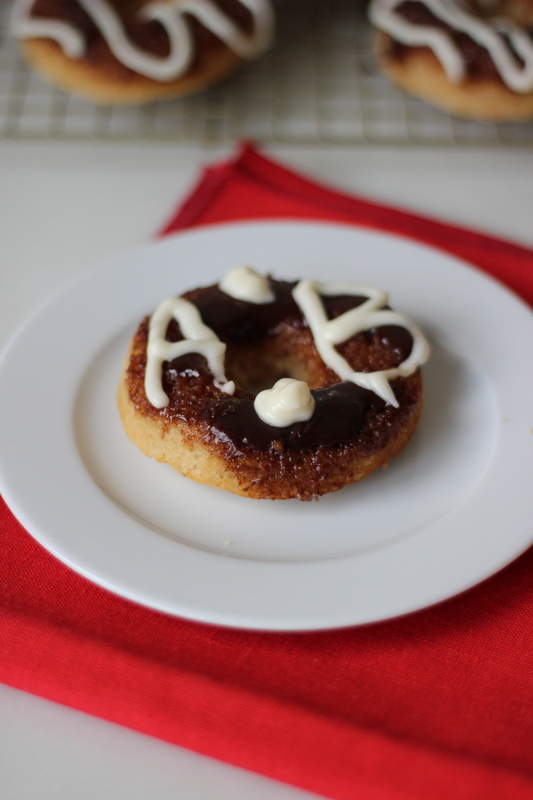 If you follow my blog regularly, you probably think that I celebrate donuts on a weekly basis. I have been obsessed with making them ever since I bought this amazing donut pan ! 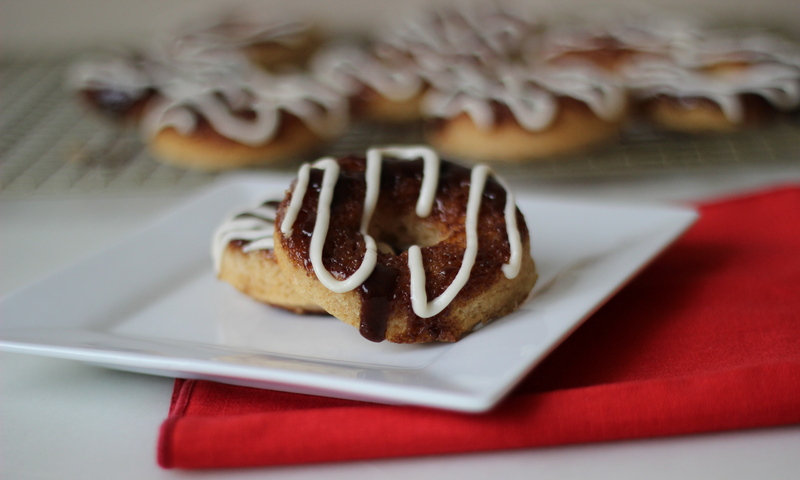 I decided that I had to celebrate this holiday with baked Cinnamon Roll Donuts with Cream Cheese Icing. Now I know that a baked donut is not the same as a fried donut, but honestly, they really are great. The key is to not overmix the batter and to not overbake them. The result is a light and tender donut, without the mess of frying and without the extra calories and fat! 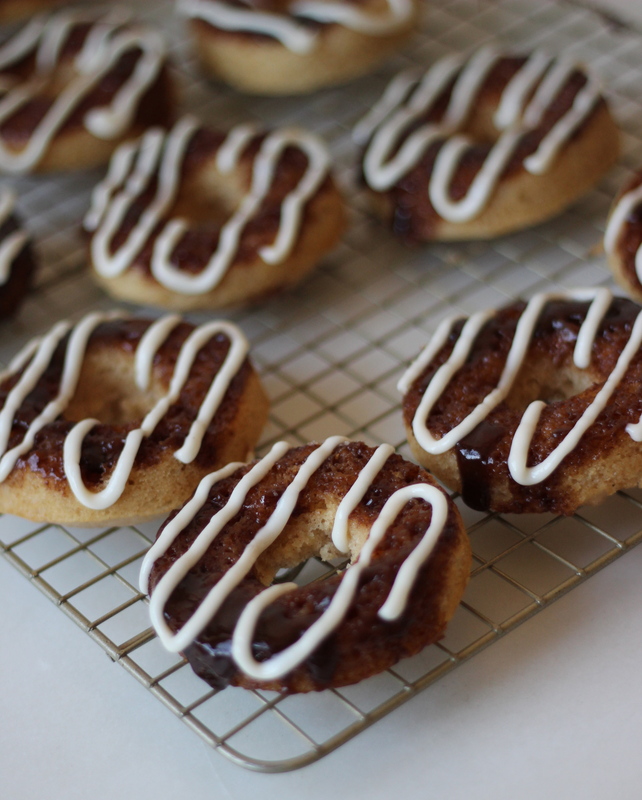 On Saturday morning, I made Cinnamon Roll Donuts with Cream Cheese Frosting. I mean how could those be bad?? All of your favorite cinnamon bun flavors baked into a donut! These were soooo good. The smell of cinnamon in our apartment was intoxicating! There are a few steps involved, but the result is totally worth it. First, make a cinnamon / butter / brown sugar topping. Put a little bit into the bottom of each donut cavity and spread it around. Then mix up the batter, and spoon that on top of the cinnamon. Be careful not to fill the cavities too full. I find that just under ¾ full makes my donuts look just perfect! Bake the donuts , let them sit for about 5 minutes, then turn them out onto a wire rack. Not all of the the cinnamon goo (technical term) will come out of the pan. Initially, I was really upset about this. Then I realized that a) I could take it out with a rubber spatula and put it on the doughnut b) I could eat it plain as it started to harden up and c) the donuts had plenty of cinnamon flavor even without all of the goo. Finally, make the cream cheese icing and drizzle it on top. I was going for all pretty zig zags. Then TheBetterHalf requested one with his name on it, so who am I to say no. You can wait for the icing to set a bit. Or you can just dig right in! I obviously recommend the latter. What a great way to celebrate Doughnut Appreciation Day! 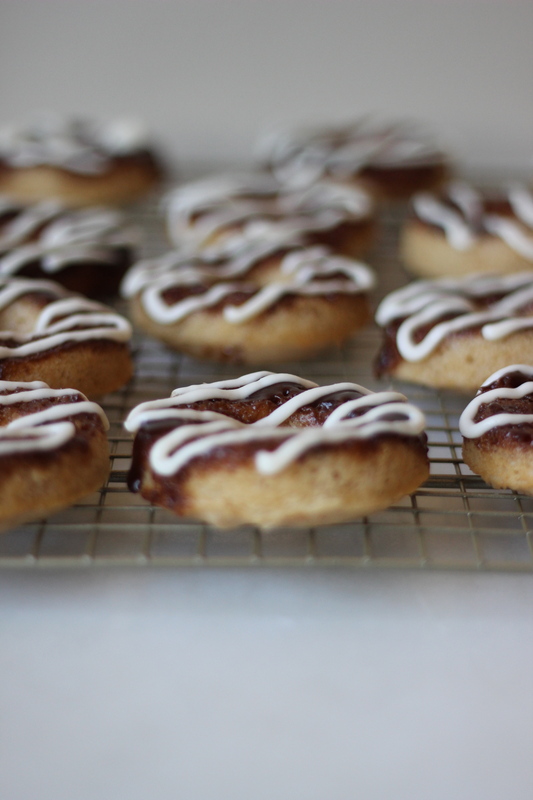 This recipe makes about 18 donuts, so you will need to bake these in two batches if you don’t have multiple donut pans . In a small saucepan, melt butter. Add brown sugar, cinnamon, cornstarch, salt and milk and whisk until combined. Heat mixture until it just starts to boil. Remove from heat and stir in vanilla. Spoon a little bit of topping in each donut cavity and spread around. In a medium bowl, whisk together the flour, sugar, baking powder, cinnamon, nutmeg, and salt. In a large bowl, whisk together the egg, buttermilk, melted butter, and vanilla. Add the wet ingredients to the dry ingredients and mix until just combined. Do not overmix. Batter may be slightly lumpy. Spoon the batter into the donut pan, on top of the cinnamon roll filling, filling each one about ¾ full. Bake for about 8 - 10 minutes. Allow to cool for 5 minutes in the pan, then turn the donuts out onto a cooling rack. Not all of the cinnamon roll topping will come out of the pan - you can leave it as is, or use a small rubber spatula to gently spread the excess topping onto each donut. Sift the confectioners’ sugar into a medium bowl. Add the cream cheese, 1 tablespoon milk, and vanilla. Using a hand mixer, beat on medium speed until light and fluffy. Add more milk if it seems too thick. Spoon the icing into a small ziplock bag and seal. Snip off the corner of the bag, and decorate the donuts with the icing. Who can wait for icing to set?? These look too good to wait!! I sure can’t – I have no patience when it comes to sampling baked goods!! Another drool-worthy recipe, Catey Lou! Cinnamon rolls? Donuts? I feel like stuffing my face in these … gosh, they look delicious! I have always wanted to make my own baked donuts, especially since it has been years since I’ve eaten one. These are so pretty! Pinned! 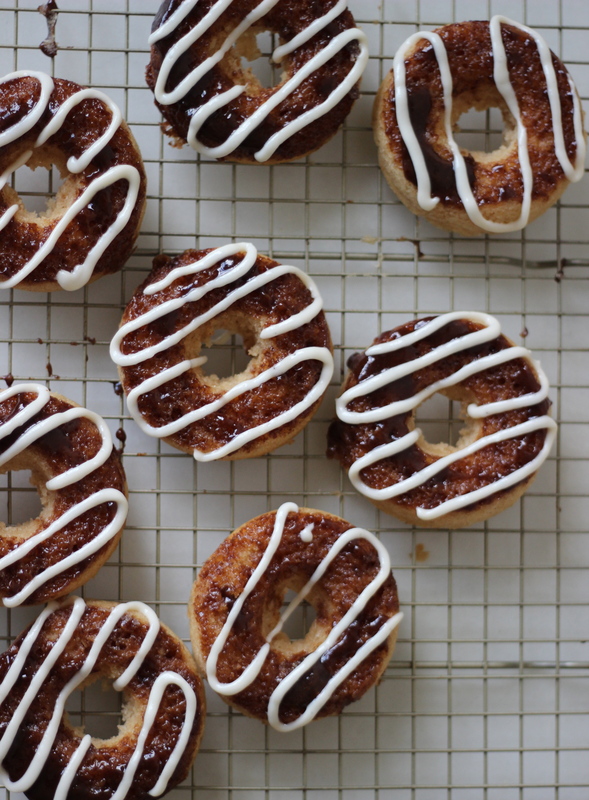 Cinnamon rolls and doughnuts combined into one delicious treat? Yes please! Thank you for sharing. This would make a cold fall morning so much more enjoyable! Thank you – they definitely make the cold more bearable! Wow! These look outstandingly delicious and I can’t wait to make it! Thanks – let me know if you make them! 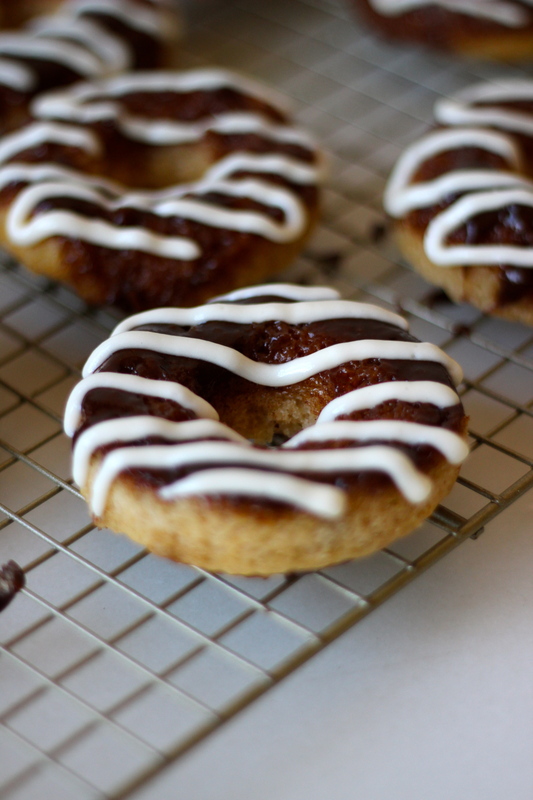 I love the cinnamon topping and icing zig zag. I bet these are great! Thank you so much – we loved them!! For the record, I only ate 11 of these. These look fabulous! I wish I could have one with my morning coffee! Love the drizzled icing too. I like how you think, Tina! Doughnut day every day! !